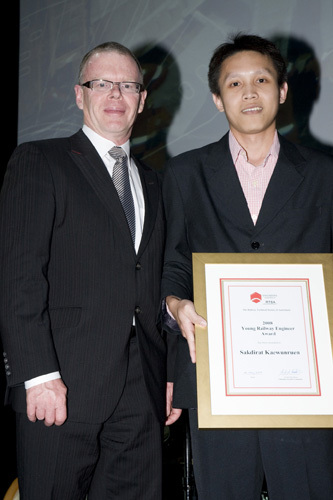 THE 2008 YOUNG RAILWAY ENGINEER AWARD IS MADE TO MR. SAKDIRAT KAEWUNRUEN WHO IS A DESIGN ENGINEER WITH RAILCORP. He holds Bachelor of Engineering and Master of Engineering degrees from Thailand and was employed as a civil engineer with the Department Public Works, Royal Thai Government. Mr. Kaewunruen then joined the Faculty of Engineering at the University of Wollongong where he worked for the Rail-CRC as a researcher and completed his PhD. He has authored a variety of technical publications and is a member of both Engineers Australia and the RTSA. Making the transition from academia to industry, Mr. Kaewunruen has taken up employment with Austrak, engaged principally in the design of standard and gauge-converted sleepers.